**Editor’s Note: This interview was conducted by Ken Morton Jr. He is a distinguished country music writer, and the Owner/Editor of That Nashville Sound and Saving Country Music contributor. If songwriting is storytelling set to song, then one must look to a musician’s wishing well of history to see the experience from which they draw from. For Chris Roberts, that well is deep and pure with an undeniable passion for music. Few artists can lay claim to have been born in the Deep South delta blues, grown up in the Wild West of Montana, stood in front of Broadway’s bright lights in New York (in the production of The Civil War), sung blissful harmony across the country radio airwaves (as part of Decca-signed trio One Flew South), shared the stage with Willie Nelson and Neil Young at Farm Aid, published an incredible catalog of songs written alongside some of Nashville’s brightest stars and writers, produce albums for multiple other artists, laid claim to being his church’s music director in a congregation that reads like a who’s who of the music business (St. Augustine’s) and lastly, been as active in using that music gift for charitable and patriotic endeavors. I have been blessed to have listened to much of his rich catalog of material across this new project and beyond, and it provides a reminder that there’s still meaning in the music being made each day in Nashville. While radio can come off as one-dimensional, Roberts’ catalog persuades you that there still can be a diversity in sound and content produced out of Music City. It has meaning in the lyrics, nuances in the musicianship, emotion in the narrative and differentiation in the production. In this cookie-cutter age, it stands out for its content and for a skill for imparting that sensation to the listener. Chris Roberts once told me in an interview I did with the band One Flew South back in 2009 that a song “is an entire novel written in three minutes. It’s a Broadway show in three minutes. It’s an entire lifetime in three minutes. A great country song can be a guiding post for someone’s life.” That musical guiding post, his moral compass, has pointed him to a new home. Catch This Music is a small collective of songwriters/producers/musicians that are skilled in providing a new song one day, record a demo the next, produce an independent album the following day as a recording studio, and release a solo album for one of its artists on day four. It is completely vertical as a music company, the staff is nimble and multi-talented in their abilities. 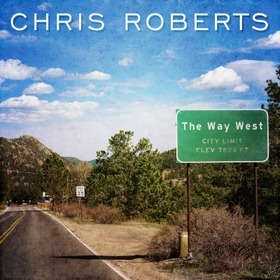 Roberts’ new album The Way West features many of Chris’ favorite co-writers, including Jason Gantt, Sam Ashworth (Switchfoot, Joy Williams, Kris Allen), Johnny Bulford (Lee Brice, Chris Young), Chris Gelbuda (Meghan Trainor, Billy Currington), and Scott Stepakoff (Tim McGraw, Kip Moore). The Way West is an album full of the kind of musical diversity and emotional longing you might expect from a wanderer such as Chris Roberts. You’ve had quite the musical journey, from Broadway to a harmony trio to a publishing deal there in Nashville writing for other artists. How satisfying is it to have a finished product now with your own name on the front? It’s very satisfying and very nerve-wracking. Clearly, I was comfortable in groups working my way through Broadway casts and the trios and then duos (with songwriter Johnny Bulford in project called Summerlin Road). I don’t know why I never thought to pursue a solo record on my own. I suppose I’ve always loved harmony. I’ve always loved the dynamic of working with others. That just seemed like a natural fit for me. A solo album was always out there on the horizon and it just never seemed like the right time. Working with Catch This Music and all of the songwriter guys and artists I’ve come to know over the years led me to think this is the right time to put together a Chris Roberts record that was representative of what I could do. For someone who isn’t familiar with what Catch This Music is, give a Readers Digest version of what it is. It isn’t your typical music label by any means. No, you’re right, it’s a little different. It started as a music studio there on Music Row. It was originally called Bayou Studios. A lot of Tracy Lawrence records were cut there, actually. Eddie Robba, the President of Catch This Music, purchased it and turned it into Catch This Music and made it very attractive for a lot of artists to come in and cut their stuff there. He decided he wanted to do even more on Music Row. He started this publishing house. I think I was their first writer and then he signed Ella Mae Bowen, Marcus Hummon, Autumn McEntire and now a fifth writer named Scott Stevens. Within a year, which is really a very short amount of time, they became a bonafide publisher and label management company. It’s kind of a 360 degree version of what music can do. For someone who hasn’t heard the album yet, how would you describe it from the artist’s perspective? I think of it as a singer-songwriter record. I grew up listening to stuff like James Taylor and Boz Scaggs. It has a fair amount of Nashville in it as well, however, because of the players I chose to bring in on the project. I have Emmylou Harris’ bass player, Hall and Oates’ piano player and these guys that are some of Nashville’s staples. They certainly helped define the sound. Many of the songwriters that worked on the project are friends of yours. For a songwriter who has hundreds if not thousands of songs in your catalog, how did you go about narrowing them down to something short of a box set on your debut album? I have so many songs. I had a lot to choose from. These are sort of the ones that were towards the top of the pile as the label made this project available to me and the idea of this record came out. There were a couple of songs in there that I had in my back pocket for a couple of years, but most of it is songs that happened to be there at the time. It was the most recent so it felt right for this project. The writers I was working with include Jason Gantt, who helped me produce the thing and played all over the record. He and I wrote several of the songs together. There’s a thing in Nashville that a group of us songwriters do about once a month that we call the Placeholders. It includes myself and Scott Stepakoff and Jason Gantt and Jacob David. All those guys contributed and they were the songs that were right for the time. I’m guessing one of the tracks you kept there in your hip pocket was the song “On My Way to You.” That track has been on hold by half a dozen very large artists in Nashville. It seems apropos that it ends up on your album first. Well, I probably wouldn’t have minded if someone else had a number one with it right away first (laughter). But if the way the world has to hear it first is with me singing it, that’s fine. Walk me through the title of the album and its importance and relevance to the project as a whole. That song just showed up. I knew I wanted a track that kind of had that Wings/Paul McCartney feel to it. I felt like it was important to the project because that was another key influence to me musically. The lyric didn’t take long once we knew where it was headed. I was telling Jason that we needed a song about Montana. We needed a song about my youth and my life in the West. I spent some time in New York. I’ve spent some time in Nashville. I always tell people I’m working my way back west. This made a different kind of sense to me. I think the lyric is a little obtuse. I don’t think it’s real specific in any way, but it makes a lot of sense to me. And some other people have been able to say it makes a lot of sense to them as well. That’s what’s great about a song. You can let the lyric do what it does. With One Flew South, you were writing and choosing songs that specifically were built around three-part harmony. Now solo, how did your approach differ this time around? I could spend more time working on the lyrical content this time around with the songs. They didn’t necessarily have to have big open choruses with big open vowels. It didn’t have to be one of those old Eagles songs that are easy to harmonize to. It could be a little more about the storytelling and I could let the lyric do a little bit more of the talking. How much of your Broadway background influences that storytelling in your songwriting? A lot, I think. I was just doing demos this morning for somebody and had spent about 20 minutes trying to sing this song. I didn’t know the song, I had heard it that morning for the first time. I didn’t like it because I didn’t write it (laughter). But it’s my job as a singer to sing other people’s work. I wasn’t getting it. It wasn’t making a lot of sense. And finally, I realized that I wasn’t paying very close attention to what I was saying. I finally sat down and read the lyrics and locked into what it was saying and realized that it was a really good song. It really influences the directions I go musically. I really need a lyric that intrigues me and tells a story—like most of the Broadway songs do. They tell great stories to music. It makes sense to me. When I first started writing songs, I was writing songs for relatives that were having kids and weddings and stuff. But every time a relative would have a kid, I would write them a lullaby. I even thought at one time I could do an entire album full of lullabies. I had written one for my first daughter Emily that my wife Wendy and I had. But I had not written one for our second daughter, Abby. Several years went by and we were busy and it just never happened. I needed to be writing songs for other people. But I had it started. I had a lullaby thought started. I had mentioned it at home. I wanted a more intimate piece to close out the album with just me and a piano. My wife had reminded me of that song. I went into the studio and finished it that same day. It’s a nice way to finish the record, I think. Nice and personal. So as usual, your wife Wendy knew best again. 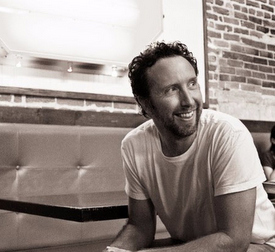 I usually close out these interviews with the question, “What is Country Music mean to you?” Now, I’ve had the privilege of doing that once with you already in a piece while you were with One Flew South. It’s one of the better descriptions of how “a song can be a guiding post for someone’s life.” There’s been lots of water under the proverbial bridge since that quote back in 2009. With hundreds of songs penned since that time and a new solo album headed for release, has that outlook or description changed at all? No, except I feel older now (laughter). No I still stand by that. I think that’s true. I think that people need music. That’s what moves people. At the end of the day, is that what motivates you the most to keep chasing a musical dream? Absolutely. The goal is to find those stories that resonate. You just want to write a story to music. Man, after reading the news about Joey Feek this morning, and then listening to “Song For a Girl,” it really hit me. Great interview, got me interested to hear his music. I liked the line about whatever his description was, in a former interview, about a song being a guiding post in life-I can’t say that any one song has been a guiding post in my life, but the music I love has been with me through good times and bad, not to mention just the sheer pleasing of my aural sense. Anyone with a daughter has got to listen to Song For A Girl, and have a hanky with you.